Well, for those of you who don’t know, Elvis “The King” Presley was a famous singer, actor and showman. The Elvis® - A Little More Action™ slot machine belongs to ITG’s branded slots and you can’t really get more branded then using the King of Rock n’ Roll’s name. This slot is great with 50 pay lines over 5 reels, colourful Las Vegas styled symbols and plenty of photos of the king himself. As soon as you hit the SPIN button, Elvis famous song A Little More Action starts to play and it continues next time you press the button. If you just want to listen to the song, I suggest you use the auto play function. Elvis® - A Little More Action™ delivers the Elvis Las Vegas theme successfully and stands alone as one of the greatest slots ever made. It’s filled with great music, great symbols and great bonus features…but don’t forget the best part - his majesty himself – Elvis Presley! Elvis® - A Little More Action™ delivers great graphics and probably the best music score known to be used in an online casino slot. The game window is fantastic; the details, colours and symbols are of the highest quality. The sound is great too as most of the sound is overtaken by the great Elvis song A Little More Action. 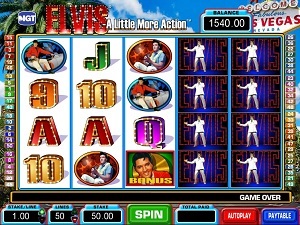 The concluding impression of Elvis® - A Little More Action™ is a strong one; Elvis is the king and this slot machine from ITG is not shy to show it. The lower paying symbols are the card deck symbols 9 through A and they are very suitable for the Las Vegas theme. The rest of the symbols are photos of different stages in the King’s career. The Wild is the Elvis symbol with a standing Elvis in front of the neon sign that spells ELVIS. This symbol will substitute for all other symbols except for the Bonus Scatter. It also has a Stacked Wilds feature which will cover an entire reel. The Bonus Scatter is the symbol with the wording of Bonus and, obviously, a photo of Elvis. The Bonus Scatter pays 2X total bet. If you hit the Bonus Scatter anywhere on the reels 2, 3 and 4 you will trigger the Action Free Spins Bonus. As soon as the Bonus Scatter appears on the 2nd, 3rd and 4th reel, the Action Free Spins Bonus is initiated. You start the Action Free Spins Bonus with 5 free spins. You can re-trigger the bonus by getting three Bonus symbols on a free spin, which award you an additional 5 free spins (up to a maximum of 255 free spins for your entire bonus). Elvis® - A Little More Action™ has 50 pay lines for you to bet on. The lowest bet per line is 1 casino credit and the maximum bet per line is 1,000. You can easily set your betting preference by using the + and – buttons in the lower part of the game window. « More slotmachines guides Article last updated: Thursday, August 09, 2012.